home » volunteer-surveys » gbw » about » background » projects » Garden Blackcap Survey - welcome! Garden Blackcap Survey - welcome! 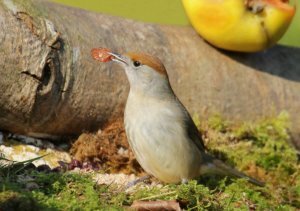 Do you have more female Blackcaps in your garden than males? Blackcaps are an increasingly common sight at garden feeding stations during winter and are spotted most often early in the New Year. The foods that we provide seem to be having a profound effect on the ecology of these birds, changing their migratory patterns and subsequent nesting habits. 1) Which foods are Blackcaps eating? 2) Are there equal numbers of male and female Blackcaps? 3) Are the Blackcaps aggressive with other, similar sized birds?